Hotel ibis Muenster City. Book your hotel in Muenster now! The ibis Münster City hotel is ideally located for sightseeing and business, between the historical old town and the main train station. The exhibition and congress center is just a few minutes' walk away. Park your car in the parking garage. Our hotel has a contemporary design and state-of-the-art facilities, both indoor and out. Enjoy the pleasant, relaxing ambiance. 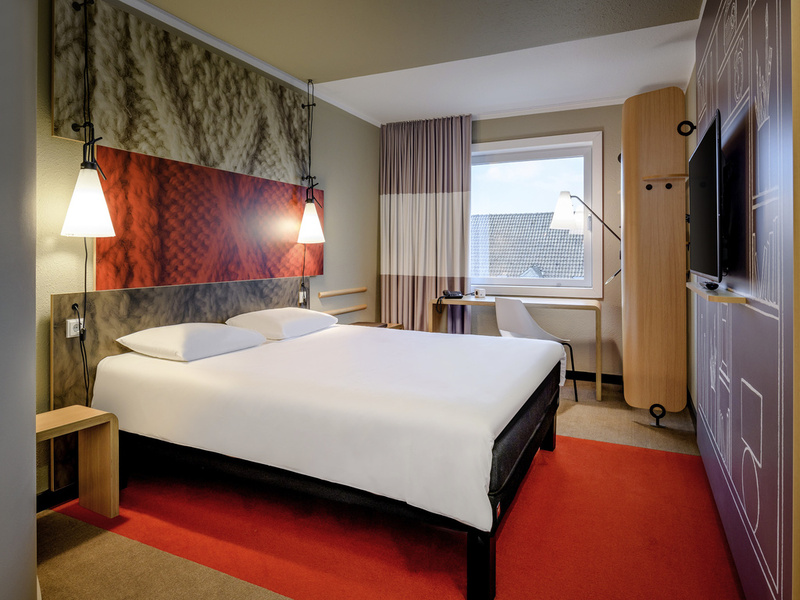 The ibis Münster City hotel has 65 welcoming rooms with wonderfully comfortable Sweet Bed by ibis beds. All rooms are air conditioned and soundproofed and feature free WIFI, a desk and TV with a range of Sky channels. Experience was as always on point for what I paid. Room came with enough space, everything was clean. The ambience of the room itself was comfortable. Not to fancy but not to basic either. The hotel is located in walking distance to Münster's Altstadt and we combined a visit at Münster's weekend market with an overnight stay. The hotel is located not too far from the main station but you can't her the trains. The parking near the hotel is convenient and affordable. The rooms are not very big but you will find its big enough. The bathroom is size-wise okay and the water pressure in the quite clever shower cabin is amazing. We will come back for sure. Convenient location if arriving by train. A very easy walk from the train station, and then easy to get to the center of old town. Quiet rooms, a filling breakfast, and helpful staff. Also conveniently located near public bus lines. We'd stay there again. There was in the room bad smell and the temperature was adjusted to 18 degrees. Additionally to the bad smell there was cold. I opened the window, but it didn't help to the smell. When going to sleep I adjusted the temperature to 22 degrees. The air condition fan worked loud all the night. It didn't get warmer. I was so tired that I slept the night hearing to the stable noise of the fan. No heartiest moment, even though I mentioned in advance out purpose of visit. Otherthan a nice hotel. Thank you guys. One of the best ibis Hotels! Excellent room with superb bed, clean and intact toilet/shower, large TV (!) mounted directly in front of bed at optimal position. Bar / breakfast / social area very good with relative good internet (could be bit faster). Ideal location from train station / close to centre of town. I would have wished for sheer curtains in addition to main curtains...That would have made room exceptional since cannot dim lights in room and main curtain block out all external light. One gripe I have with all ibis Hotels as Gold member is that early check in NEVER works even when requested!!! This is a real issue when one travels internationally for more than 16 hours, all that I want is a bed! The ibis perks should really be looked at carefully, and hotels should commit to customer request otherwise these membership benefits are worthless! BTW: I did not receive welcome drink and had to ask for voucher couple of hours later! Seems like Hotels do not know what it means to be member and the benefits due to customer... I should note that online check appears not to have worked...I certainly did not get impression clicking link made any difference. Near the HBF - easy walk to theatre - slept very well - breakfast great! Very poor reception which did not improve. The Greek across the road was excellent. Room was basic, no kettle or refreshments. Good overall but a bit expensive for what you get. My choice goes to 4 and 5 star hotels generally. This being the only Accor or other large brand in Munster, I felt forced to pick IBIS. I must say that in the end, it was great. The team was very helpful. The Hotel was clean and renovated. Pleasantly surprised. Very helpful staff and night staff. Well done. Just overnight, however extremely pleasant experience. Very friendly. TeTe informative and helping. Nice staff . Great breakfast, hotels and ibis in Germany much better than ibis and hotels in France. I am now in ibis Avignon Centre Gare 42 Boulevard Saint-Roch 84000 AVIGNON France 7pO: +33(0) 4 90 85 38 38 - Fax: +33(0) 4 90 86 44 81 5pVHUYDWLRQ I canceled my second day and I am moving to another hotel. ibis in Avignon Center Gare is disaster. I like this hotel, very convenient location, friendly and helpful staff. Safe parking for my car, close to the station. Room is clean, wifi is good as is breakfast. I always try to book this one when I stay. Easy to find and parked on street till we checked in. We were directed to the public parking rather than the Ibis garage but it was just next door so no problem. Comfortable room with airco and a good nights sleep. It was a short walk to the center. There was a nice Greek restaurant across the street and a nice bakery at the end of the street on the Ibis side. Staff was very friendly and helpful. Facilities were very clean and well kept - I would definitely chose this chain for any future European travels.